Your search for 'APP' has returned no results. If you are using Ultraloq App, how to transfer to U-tec App? Step1. Install U-tec App. Please search keywords “U-tec” to install U-tec App in App Store or Google Play. Step2. Log in U-tec App by your U-tec Account. You don’t need to register a new U-tec Account again. Step3. Add UL3-BT to your U-tec Account by U-tec App. You don’t need reset UL3-BT as factory default. The old admin code of the lock does still work. Step4. Begin to enjoy UL3-BT by U-tec App. 1. Please have to add UL3-BT manually by U-tec App. U-tec App can’t sync the device list automatically. 2. Once set up UL3-BT in U-tec App successfully, all photos and names uploaded before will clear. 3. Except for the photos and names, all other data (User ID, fingerprints, codes) and logs will be synced automatically to U-tec App. 4. For Ultraloq App, UL3-BT allow multiple U-tec Accounts are registered as admin. For U-tec App, only one U-tec Account has admin right. It’s a secure update. 5. If you want to use Backup and Clone features in U-tec App, you have to Backup the data again before Clone. U-tec App can’t access the old backup data. What’s the new features of U-tec App for UL3-BT? In order to be compatible with more Ultraloq products in future, Ultraloq team prompts U-tec App which contains extra features and benefits to help you get the most out of your UL3-BT and the other Ultraloq products. Ultraloq R&D will pay more attention on U-tec App. So RECOMMEND CUSTOMERS TO ENJOY U-TEC APP. Here are the detailed comparison between Ultraloq App and U-tec App for UL3-BT. * Wifi Control, control Ultraloq UL3-BT remotely through Ultraloq Bridge. * User Manage, Admin can add, delete and enable/disable the user (fingerprint, code or App access) by App. * Ultraloq App only allow Admin to unlock by App. But for U-tec App, Admin not only unlock by himself but also can share the App access to allow the normal users to unlock by U-tec App. * Ekey, add the temporary user to App access, include schedule and time limit. * Smart Notification, receive a smartphone notification when someone opens your door. * Smart Home Integration, include Alexa, IFTTT and so on (must work with Bridge). If you are using Ultraloq App for UL3-BT, how to transfer to U-tec App? How to set up Bridge connected? 1. 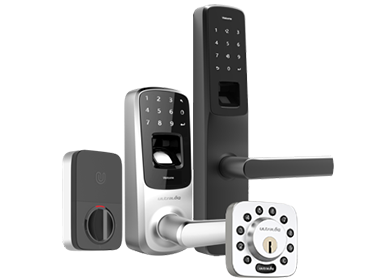 Best distance between Ultraloq UL1 / UL3 / Combo smart lock and Bridge is less than 10ft. Because of the low power design and AA batteries power, the distance is limited. 2. Best distance between Bridge and Router is no more than 50ft. It's also related to the strength of the Wifi. 3. Bridge only works with 2.4GHz Wifi, 5GHz Wifi does not work. 4. Bridge does not support any PPPoE internet and Static IP Address Internet. 4. Make sure U-tec App (Not Ultraloq APP) is the latest version in App Store or Google Play. 5. Press the Wifi icon of Bridge for 5 seconds, then re-plug Bridge. The indicator will keep Yellow. 6. Pair Bridge in U-tec App. How many Ultraloq smart locks (UL1, Combo and/or UL3 BT) does the U-tec app support? Can the App control multiple locks? We'd like to install 5 of these on a couple of doors and would like to manage them all through the app? Yes, U-tec App can control multiple locks. You can manage all of the 5 Ultraloq smart locks from U-tec App. Just name them differently so you know which is which. Can you limit entry time from 9:00-17:00 every Monday to Friday or a specific time period like January 1 to 30? 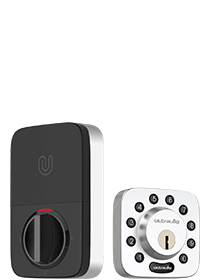 Yes, you can share eKey to access Ultraloq UL1 / Combo / UL3 BT smart lock in U-tec App . You can use Bluetooth to connect when you are near Ultraloq UL1 / Combo / UL3 BT smart lock. You need Ultraloq Bridge to access, unlock, and create settings remotely. How long is battery life of Ultraloq UL1? Ultraloq UL1 is powered by 4 X Alkaline AA batteries for up to 8,000 times access. That is to say battery life is up to 1 year on an average use of 20 times access per day. You will also get low battery alert via beeps, red LED flashing and notifications in app when your Ultraloq can still be unlocked for hundreds of times so you will have more than enough time to replace the batteries. My app doesn't connect to Ultraloq UL1 / Combo via Bluetooth. 1) Install the latest U-tec App from App Store and Google Play. Please avoid download Ultraloq App. 2) Open the Bluetooth of the smartphone, and disconnect the Bluetooth connection with other devices. 3) Make sure UL1 is factory default. Use a paperclip to pin the Reset hole for 5 seconds . Reset UL1 to Factory Reset Mode. All data will be erased. After reset UL1, UL1 can be unlocked with any fingerprint or key fob, and UL1 will beep 6 times and LED will stay red as a notice. 4) Create U-tec Account and sign in by U-tec App. 5) Press "Add Device Ultraloq UL1", then press "Scan for Ultraloq" button. 6) Choose this device, then press "OK"
If U-tec App shows UL1 has been registered by another U-tec Account when you add UL1 to U-tec App, please have to contact to this account and ask him to remove it from his U-tec Account. Because UL1 only supports one U-tec Account to do Admin. If there are "Time Out" message or other problems, please do troubleshooting. 1) Reinstall all batteries of UL1to reboot UL1. 2) Restart the smartphone to reboot its Bluetooth. 4) If the problem still exists, please try to use another smartphone to connect the lock. And update this problem to support@u-tec.com. 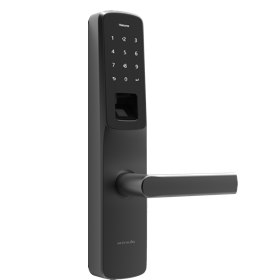 How to use Ultraloq UL1 smart lock via U-tec App? How to delete an Ultraloq? How to use “Knock to Open”? How to set lock status? How to unlock an Ultraloq? How to add an Ultraloq? What happens if the batteries go dead? How can I still get in? You will get "low battery alerts" via beeps and LCD prompt when you can still open door by 1000 times. Backup mechanical keys work always even batteries go dead. How can I add my CamGuardian H2-N8E / H2-D4 video recorder in my APP? How many devices can I add? Open the CamGuardian APP, login, click "+" located in the up right corner and scan the UID on the back of the CamGuardian. The device will be added to CamGuardian APP in seconds. There is no limit to add devices.